1. SAMUEL A6 KINGSTON (PAUL5, SAMUEL4, PAUL F3, SAMUEL2, PAUL1) was born January 23, 1893 in Three Islands, Wayerton, NB, and died July 17, 1965 in Newcastle, NB. He married LILLIAN ISABELLA (CWL AA52) LOGGIE August 16, 1920 in St Andrews Church, Loggieville, NB, daughter of GEORGE LOGGIE and ANNIE KELLY. The following copied from The North Shore Leader, July 1965 following his death. Samuel A. Kingston, a prominent lumberman of the Miramichi for many years, died at the home of his daughter, Mrs William Vickers, Lawlor Lane, on Saturday July, 17 after a lengthy illness. He was 73 years of age and was born in Wayerton, a son of the late Paul and Mary (Crowe) Kingston. As a young man Mr Kingston was associated with his father, in lumbering operations on the Northwest Miramichi and later carried on his own lumber business for many years. He had lived in Newcastle for about 40 years, first at Chaplin Island Road and later on King George Highway. Mr Kingston was a member of St Mary's Church and of the Holy Name Society. Surviving are his wife, the former Lillian Loggie of Napan, six sons and six daughters: William of Wayerton; (Anne Marie) Mrs Joseph Weisler of Appleton, Wisconsin; George, Three Rivers, Quebec; (Monica) Mrs William Vickers, Newcastle; (Rita) Mrs Peter Byberg, Greenwood, Ont. ; (Carmel) Mrs Donald Leslie, Ferry Road; (Bernadette) Mrs Patrick Sullivan, Port Credit, Ont. ; Aloysius, South Nelson; Frank and Paul, both of Newcastle; Joseph, Oshawa, Ont. and Patricia ,Toronto. 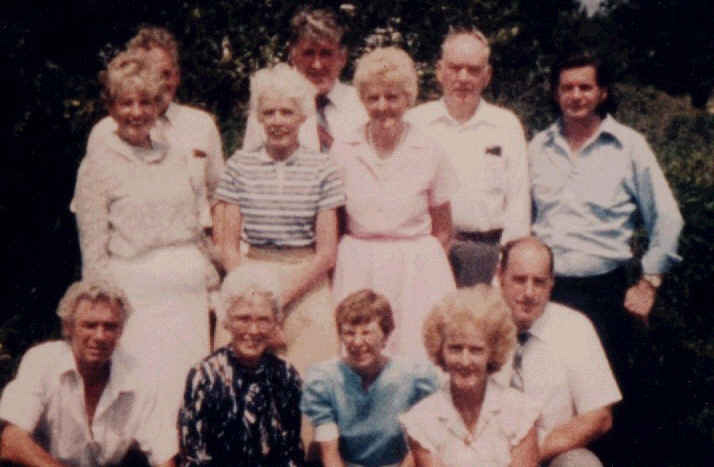 Two brothers and four sisters, also survive: Paul Kingston, Wayerton; Dr Louis Kingston, Barre, Vermont; (Ann) Mrs A. L. Larner, Burlington Vermont; (Margaret) Mrs Patrick O'Shaughnessy, Burlington, Ont. ; (Kate) Mrs Jerry Howe of Mount St Joseph, Chatham, and (Suzanne) Mrs. George Johnton, Newport News, Virginia. There are also 45 grandchildren. The funeral was held Tuesday morning from the family home on King George Highway to St. Mary's Church where High Mass of Requiem was offered by his nephew, Rev. Paul Kingston of Montreal. St Mary's High School Choir was in attendance and priests present in the sanctuary were: Rev. D. J. Warner, parish priest at St. Mary's; Rev. T. J. Mckendy, Douglastown; Rev. B. M. Broderick, South Nelson; Rev. J. C. McKinnon, Loggieville; Rev. R. H. Munroe, Chatham Head; Rev. Donald Harriman, Saint John; Rev. Dr. D. C. Duffie Csc., President of St Thomas University, and Rev. James MacDonald Csc., superior of Holy Cross House, Fredericton. Interment was made in the family plot in the old St. Mary's Church cemetery, the pallbearers being his five sons, William, George, Aloysius, Frank and Paul and a grandson, Barry Kingston. The honorary pallbearers were W. Stafford Anderson, Harrison Gunn, Edwin Brown, Albert Vickers, Harvey Shattuck, Earl McAllister, John Ryan and Alex Baisley. All of Mr. Kingston's sons and daughters were here for the funeral except Mrs Sullivan and Joseph. Also coming to Newcastle from a distance were his brother and sister, Dr. Louis Kingston and Mrs O,Shaughnessy and his nephews and nieces, Rev. Paul Kingston and Mrs Murray Crowe, Montreal; Dr. and Mrs Mark Kingston, Rockingham, N. S. Terrance and Dermot Kingston, Fredericton and Leo Kingston, Dalhousie. 2. i. WILLIAM JOSEPH (CWL AA54)7 KINGSTON, b. August 24, 1921, Hotel Dieu Hospital, Chatham. 3. ii. ANN MARIE (CWL AA55) KINGSTON, BSC NURSING, b. December 01, 1922, Hotel Dieu Hospital, Chatham, NB; d. April 29, 1986, Appelton Wisconsin. iii. PATRICIA (?) 1 (CWL AT22) KINGSTON, b. Bef. 1926, Newcastle, NB; d. Bef. 1926, Still Born, Newcastle, NB. 4. iv. GEORGE LEO (CWL AT11) KINGSTON, BMECH ENG, b. April 11, 1926, Hotel Dieu Hospital Chatham, NB. 5. v. MONICA MARGARET (CWL AT12) KINGSTON, b. April 27, 1927, Hotel Dieu Hospital, Chatham, NB. 6. vi. RITA CATHERINE (CWL AT13) KINGSTON, b. November 27, 1929, Hotel Dieu Hospital, Chatham, NB; d. October 31, 1988, At Home in Greenwood, ON. Age 58. 7. vii. CARMEL THERESA (CWL AT35) KINGSTON, BSC DIET, b. September 30, 1930.
viii. PATRICA 2 (CWL AT34) KINGSTON, b. 1932, Newcastle, NB; d. 1932, Died a few days old, Newcastle, NB. 8. ix. MARY BERNADETTE (CWL AT14) KINGSTON, b. June 26, 1933, Hotel Dieu Hospital, Chatham, NB. 9. x. ALOYSIUS SAMUEL (CWL AT15) KINGSTON, b. July 04, 1935, Hotel Dieu Hospital, Chatham, NB. Generation No. 2 2. WILLIAM JOSEPH (CWL AA54)7 KINGSTON (SAMUEL A6, PAUL5, SAMUEL4, PAUL F3, SAMUEL2, PAUL1) was born August 24, 1921 in Hotel Dieu Hospital, Chatham. He married LOREEN SHERRARD January 07, 1948 in St Mary's, Newcastle, NB, daughter of DAVID SHERRARD and EVA ALLISON. Medical Information: Lost some sight in one eye when hit in eye with a branch. Eye sight also diminishing with age, particularily at night. 13. i. BARRY LESLIE (CWL AT16)8 KINGSTON, b. February 15, 1948, Hotel Dieu Hospital, Chatham, NB. 14. ii. BRENDA LILLIAN (CWL AT17) KINGSTON, b. September 27, 1950, Miramichi Hospital, Newcastle, NB. 15. iii. CHRISTOPHER LEE (CWL AT71) KINGSTON, b. February 27, 1953, Miramichi Hospital, Newcastle, NB. 16. iv. CAROL ANNE (CWL AT72) KINGSTON, b. June 02, 1954, Miramichi Hospital, Newcastle, NB. v. DENNIS WILLIAM (CWL AT73) KINGSTON, BSC SURVYNG, b. January 21, 1957, Hotel Dieu Hospital, Chatham; m. CATHY COSTER, July 26, 1986, St Andrews Anglican Church, Newcastle. 17. vi. SHARON PATRICIA (CWL AT74) KINGSTON, b. July 02, 1960, Hotel Dieu, Chatham, NB. 18. vii. DAVID SAMUEL (CWL AT75) KINGSTON, b. October 06, 1961, Hotel Dieu Hospital, Chatham, NB. 19. viii. STEPHEN CRAIG (CWL AT79) KINGSTON, b. January 04, 1964, Hotel Dieu Hospital, Chatham, NB. 3. 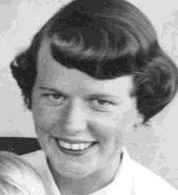 ANN MARIE (CWL AA55)7 KINGSTON, BSC NURSING (SAMUEL A6, PAUL5, SAMUEL4, PAUL F3, SAMUEL2, PAUL1) was born December 01, 1922 in Hotel Dieu Hospital, Chatham, NB, and died April 29, 1986 in Appelton Wisconsin. She married JOSEPH B WEISSLER, MD PSYCHIATRIST June 05, 1951 in St Mary's, Newcastle NB. Anne Marie was an Adventurist she drove the Alaska Highway alone In the late 1940's, over 1500 miles through the wilderness. Her obituary read as follows. ANN KINGSTON WEISSLER (Mrs. Joseph Weissler) 844 E. Alton St.
Age 63, died at 5 p.m. Tuesday, April 29, 1986 following a lengthy illness. Ann was born December 1, 1922 in Newcastle, New Brunswick, Canada. Born of true Canadian frontier stock, Ann's life bridged the distance from horse drawn sleighs to rescue helicopters. Her aggressive, hands-on life-style left its mark on all whom she touched. Unsurpassed as a mother and wife to her family, she will be remembered as a nurse, an artist, and a fighter. She is survived by her husband of 35 years, Dr Joseph Weissler; two daughters; Mary Weissler, Madison; Suzanne Weissler, Milwaukee; two sons and a daughter-in-law; George Weissler, Chicago, Illinois; Mark and Ann Weissler, Cincinnati, Ohio; six brothers: Billy, George, Aloysious, Frank, Paul and Joe and five sisters: Monica, Rita, Bernadette, Carmel, Patti, all of Canada; and many friends and admirers is her family's wish that no memorial services be held but that those who knew her remember her as the great spirit she was in life. Her body will be cremated, and her ashes returned to the trout stream, where she fished with an alder pole as a child in New Brunswick. In lieu of flowers a memorial fund is being established for the Pulmonary Rehabilitation Unit at St. Elizabeth Hospital, Appleton. The Wichmann Funeral Home and Crematory, 537 N. Superior St. is assisting the family with the arrangements. There is an Irish Galic word that describes an area where two streams meet. We, with a small bit of imagination, think of such a place as a meeting place, a gathering place, a restful place, a tenting place and other such meanings as a happy hallowed holy place. Anne Marie's ashes are scattered in such a place where the stream she fished, Ox Brook, joins the Mill Stream. The Irish word encompassing all these thoughts and meanings is AVOCA. A local artist Susan Butler has recorded music and song of Avoca. The following comes to mind at times when we think of Ann Marie, because each Friday afternoon at the small, eight grades all in the same room, Country School house we attended, each pupil was required to stand and recite a poem he or she had memorized. There were some ringers especially by myself and others because we had forgotten or were otherwise too occupied to look up and memorize anything. Since no excuse was acceptable and punishment depending upon your age could be as severe as not being allowed out for recess, to having to stay in after school to you had to have two poems memorized for the following Friday. We do not remember Ann Marie having been punished. Her offerings were usually good or she could make up a poem immediately when asked without too much previous thought. There probably was one about the pigeons in the barn, or the pigs in the corn or some such things she got away with. Ann Marie by the same token recited some really good ones and we would include the following poem entitled "THE BROOK", originally by I believe Lord Tennyson, however modified a bit by me. THE BROOK BY Tennyson (with some poetic licence by George K.) I come from haunts of coot and hern, I make a sudden sally, And sparkle out among the fern, To bicker down a valley. By thirty hills I hurry down, Or slip between the ridges, By twenty throps, a little town, And half a hundred bridges. Till by Butler's farm I flow To collect some hallowed ashes, For men may come and men may go, But I go on for ever. I chatter over stoney ways, In little sharps and trebles, I bubble into edding bays, I babble on the pebbles. With many a curve my banks I fret By many a field and fallow, And many a fairy foreland set With willow-weed and mallow. I chatter, chatter, as I flow To join the brimming river, For men may come and men may go, But I go on for ever. I wind about, and in and out, With here a blossom sailing, And here and there a lusty trout, And here and there a salmon. And here and there a foamy flake Upon me as I travel With many a silvery waterbreak above the golden gravel And draw them all along, and flow To join the brimming river, For men may come and men may go, But I go on for ever. I steal by lawns and grassy plots, I slide by hazel covers; I move the sweet forget-me-nots That grow for happy lovers. I slip, I slide, I gloom, I glance, Among my skimming swallows; I make the netted sunbeam dance Among my sandy shallows. I murmur under moon and stars In brambly Wildernesses; I linger by my shining bars; I loiter round my cresses; And out again I curve and flow To join the brimming river, For men may come and men may go, But I go on for ever. i. MARY BERNADETTE (CWL AT20)8 WEISSLER, b. April 24, 1952, Boston, Mass. ; m. JACK KAESTNER. ii. GEORGE KINGSTON (CWL AT21) WEISSLER, b. November 27, 1953, Boston, Mass. ; m. NANCY ANN SLICHENMYER, May 22, 1993, Evanston, IL. USA. 20. iii. MARK CHRISTIAN (CWL AT62) WEISSLER, MD, b. April 27, 1957, Sheboygan, Wis., USA. iv. SUZANNE MARIE (CWL AT63) WEISSLER, STRL ENG, b. May 09, 1959, Appleton, Wisconsin, U.S.A.; m. RICHARD KAEHLLER, December 10, 1989. 4. GEORGE LEO (CWL AT11)7 KINGSTON, BMECH ENG (SAMUEL A6, PAUL5, SAMUEL4, PAUL F3, SAMUEL2, PAUL1) was born April 11, 1926 in Hotel Dieu Hospital Chatham, NB. He married CHRISTINE ELIZABETH STEPHANIE (CWL AT11-1) SENG October 10, 1953 in Ascension Church, Montreal, PQ, daughter of MAGNUS SENG and CHRISTINE COUGHLIN. 21. i. STEPHANIE ANNE MARIE (CWL AT23)8 KINGSTON, b. September 18, 1954, St Mary's Hospital, Montreal, PQ. ii. MICHAEL EDWARD (CWL AT26) KINGSTON, BSC PHARM, b. July 14, 1956, St Mary's Hospital, Montreal, PQ. 22. iii. JOHN FRANCIS (CWL AT64) KINGSTON, MENG SC, b. June 19, 1957, Espanola General Hospital Espanola, ON..
23. iv. ELIZABETH MARGARET (CWL AT67) KINGSTON, BA, b. November 04, 1958, Espanola General Hospital, Espanola, ON. 24. v. PATRICIA KATHLEEN (CWL AT70) KINGSTON, B NURSNG, b. February 28, 1960, Espanola General Hospital, Espanola, ON. vi. THOMAS JOSEPH (CWL AU86) KINGSTON, PENG MBA, b. September 23, 1961, Trois Riviers, PQ. 25. vii. MARTHA ANN (CWL AU87) KINGSTON, BA BED, b. July 30, 1963, Trois Rivers, PQ. viii. SUZANNE BARBARA (CWL AU88) KINGSTON, BA, b. January 05, 1965, Trois Riviers, PQ; m. HOWARD LABILLOIS. 5. MONICA MARGARET (CWL AT12)7 KINGSTON (SAMUEL A6, PAUL5, SAMUEL4, PAUL F3, SAMUEL2, PAUL1) was born April 27, 1927 in Hotel Dieu Hospital, Chatham, NB. She married WILLIAM JAMES VICKERS September 01, 1954 in St Mary's, Newcastle, NB, son of ALBERT VICKERS and EMMA BURNS. Monica handed this poem to me October 23, 1992. It was composed by Evelyn R. Wright Maritime Letter How's the weather in New Brunswick? Are the nights and mornings cold? Are the lakes and rivers freezing As the maples turn to gold? Did the sunshine glaze the apples? And the swallows take their flight? Did you hear the marsh frogs calling, Calling, shrilly through the night? Write and tell me how the roads are,- If the salmon leaped the pools- Do the youngsters still play hookey From those funny little schools? Are the deer and moose abundant? Do the Sunday church bells ring? What's it like now in New Brunswick? Write and tell me everything. Are there seagulls over Fundy? Mushrooms on the Tantramar? Were there violets in the woodlands When the spring broke winter's lear? If it's just the same as ever Then I guess I'll have to come, For the autumn colours burn me, And New Brunswick calls me home! Bill Vickers at many gatherings recites the following grace before meals. We referred to this as the Indian Grace. We do not know who wrote this. O GREAT SPIRIT O GREAT SPIRIT WHOSE VOICE I HEAR IN THE WIND WHOSE BREATH GIVES LIFE TO THE WORLD HEAR ME I COME TO YOU AS ONE OF YOUR MANY CHILDREN I AM SMALL AND WEAK I NEED YOUR STRENGTH AND YOUR WISDOM MAY I WALK IN BEAUTY MAKE MY EYES EVER BEHOLD THE RED AND PURPLE SUNSETS MAKE MY HANDS RESPECT THE THINGS THAT YOU HAVE MADE AND MY EARS SHARP TO HEAR YOUR VOICE MAKE ME WISE SO THAT I MAY KNOW THE THINGS THAT YOU HAVE TAUGHT YOUR CHILDREN THE LESSONS THAT YOU HAVE HIDDEN UNDER EVERY LEAF AND ROCK MAKE ME STRONG NOT TO BE SUPERIOR TO MY BROTHERS BUT TO BE ABLE TO FIGHT MY GREATEST ENEMY ...MYSELF MAKE ME EVER READY TO COME TO YOU WITH STRAIGHT EYES SO THAT WHEN LIFE FADES AS A FADING SUNSET MY SPIRIT WILL COME TO YOU WITHOUT SHAME. 26. i. MARY MONICA (CWL AT27)8 VICKERS, b. June 02, 1955, Miramichi Hospital, Newcastle, NB. 27. ii. KEVIN MICHAEL (CWL AT28) VICKERS, b. September 29, 1956, Hotel Dieu, Chatham, NB. iii. JOHN FRANCIS (CWL AT84) VICKERS, b. February 28, 1960, Hotel Dieu, Chatham, NB. iv. WILLIAM JAMES (CWL AT85) VICKERS, b. August 11, 1961, Hotel Dieu, Chatham, NB. v. SAMUEL KINGSTON (CWL AT86) VICKERS, MECH ENG, b. November 03, 1965, Hotel Dieu, Chatham, NB. 6. RITA CATHERINE (CWL AT13)7 KINGSTON (SAMUEL A6, PAUL5, SAMUEL4, PAUL F3, SAMUEL2, PAUL1) was born November 27, 1929 in Hotel Dieu Hospital, Chatham, NB, and died October 31, 1988 in At Home in Greenwood, ON. Age 58. She married PETER CAMPBELL BYBERG October 08, 1955 in St Mary's Catholic Church, Newcastle, NB. 28. i. CATHERINE ALICE (CWL AT31)8 BYBERG, b. December 18, 1957. 29. ii. PETER KINGSTON (GUY) (CWL AT87) BYBERG, b. January 13, 1958, Toronto, Ontario. iii. STEPHEN PAUL (CWL AT89) BYBERG, b. April 14, 1959, Toronto, Ontario. 30. iv. SCOTT EDWARD (CWL AT90) BYBERG, b. March 29, 1961, Toronto, Ontario. 31. v. JOHN CHRISTOPHER DAY (CWL AT93) BYBERG, b. June 04, 1965, Toronto, ON. vi. ANN MARIE (CWL AT94) BYBERG, b. October 17, 1971. 7. CARMEL THERESA (CWL AT35)7 KINGSTON, BSC DIET (SAMUEL A6, PAUL5, SAMUEL4, PAUL F3, SAMUEL2, PAUL1) was born September 30, 1930. She married DONALD JOSEPH LESLIE September 12, 1959 in St Mary's, Newcastle, NB. 32. i. LILLIAN ANNE (CWL AT36)8 LESLIE, b. September 12, 1960.
ii. MICHAEL DONALD PERCY (CWL AT37) LESLIE, b. March 13, 1962; d. May 17, 1984, Ferry Road, NB. 33. iii. ROBERT SAMUEL (CWL AT95) LESLIE, b. November 04, 1963.
iv. MARY THERESA (CWL AT96) LESLIE, b. January 09, 1966. Addresses: Ferry Road, Douglastown, N.B. 34. v. BARBARA PATRICIA (CWL AT97) LESLIE, b. January 07, 1970. 8. MARY BERNADETTE (CWL AT14)7 KINGSTON (SAMUEL A6, PAUL5, SAMUEL4, PAUL F3, SAMUEL2, PAUL1) was born June 26, 1933 in Hotel Dieu Hospital, Chatham, NB. She married JOHN PATRICK SULLIVAN September 08, 1958 in St Mary's Catholic Church, Newcastle, NB, son of JAMES SULLIVAN and GLADYS PEACOCK. 35. i. MICHAEL EDWARD (CWL AT40)8 SULLIVAN, MD, b. July 09, 1959, St Josephs Hospital, Toronto, ON..
36. ii. THERESA MARIE (CWL AT41) SULLIVAN, b. November 09, 1960, St Josephs Hospital, Toronto, ON. 37. iii. MARY CARMEL (CWL AT98) SULLIVAN, b. September 03, 1963, St Josephs Hospital Toronto, Ontario. iv. KEVIN ALOYSIUS (CWL AT99) SULLIVAN, b. August 16, 1965, Mississauga Gen. in Mississauga, Ontario. 9. ALOYSIUS SAMUEL (CWL AT15)7 KINGSTON (SAMUEL A6, PAUL5, SAMUEL4, PAUL F3, SAMUEL2, PAUL1) was born July 04, 1935 in Hotel Dieu Hospital, Chatham, NB. He married MARY ELEANOR CREAMER September 24, 1960 in St Patrick's, Nelson-Miramichi, NB. 38. i. MARY ELLEN ELIZABETH (CWL AT44)8 KINGSTON, b. September 28, 1961, Hotel Dieu Hospital, Chatham, NB. 39. ii. PAULA-MARIE CARMEL (CWL AT45) KINGSTON, b. October 11, 1962, Hotel Dieu Hospital, Chatham, NB. 40. iii. JO-ANN RUBY (CWL AU00) KINGSTON, b. November 08, 1963, Hotel Dieu Hospital, Chatham, NB. iv. JOHN KENNEDY (CWL AU03) KINGSTON, b. September 07, 1965, Hotel Dieu Hospital, Chatham, NB; m. PATRICIA MURPHY, August 15, 1992.
v. SAMUEL JOSEPH (CWL AU04) KINGSTON, b. May 21, 1967, Hotel Dieu Hospital, Chatham, NB. 41. vi. MARK ALLEN (CWL AU05) KINGSTON, b. May 31, 1970, Hotel Dieu Hospital, Chatham, NB. 10. FRANCIS TERRENCE (CWL AT46)7 KINGSTON (SAMUEL A6, PAUL5, SAMUEL4, PAUL F3, SAMUEL2, PAUL1) was born October 19, 1937 in Saint John, NB. He married MARGARET ANN MILLER December 01, 1962 in St Mary's Catholic, Newcastle, NB, daughter of JOHN MILLER and JANET MCLEAN. i. FRANCIS JOHN (CWL AT47)8 KINGSTON, b. June 26, 1964, Newcastle, NB. ii. DAVID BRIAN (CWL AT48) KINGSTON, b. November 16, 1966, Newcastle, NB. iii. KEVIN MICHAEL (CWL AT49) KINGSTON, b. June 03, 1969, St. Joseph's Hospital, Dalhousie, NB. iv. NANCY LEE (CWL AT50) KINGSTON, b. October 26, 1970, Miramichi Hospital, Newcastle, NB. Paul Joseph Kingston was born on April 17, 1938. Today he resides in the Toronto area. 11. JOSEPH JAMES (CWL AT52)7 KINGSTON (SAMUEL A6, PAUL5, SAMUEL4, PAUL F3, SAMUEL2, PAUL1) was born November 19, 1940 in Saint John, NB. He married ELEANOR ROSE MARIE HOLM July 24, 1965 in St John Church, Waubaushene, ON, daughter of WILLIAM HOLM and HELEN LATOUR. 42. i. PAUL JOSEPH (CWL AT53)8 KINGSTON, b. April 26, 1966, Oshawa, Ontario. 43. ii. VERONICA JANE (CWL AT54) KINGSTON, b. June 23, 1968, Oshawa Gen Hospital Oshawa, ON. 44. iii. LISA MARIE (CWL AU09) KINGSTON, b. June 03, 1969, Oshawa, Ontario. iv. BONNIE JEAN (CWL AU12) KINGSTON, b. January 29, 1971, Oshawa, Ontario; m. GORDON ROBERT (1951) (JOHNSON) JOHNSTON, December 16, 1995, Port Perry ON. 12. PATRICIA 3 BARBARA (CWL AT58)7 KINGSTON (SAMUEL A6, PAUL5, SAMUEL4, PAUL F3, SAMUEL2, PAUL1) was born March 11, 1942 in St. John, NB. She married BRENDAN (SEVENTH SON) KELLY July 02, 1966 in ( not July 2 1942) St Domonicks, Port Credit, ON, son of SAMUEL KELLY and ROSE CORRIGAN. ii. ROBERT SCOTT (CWL AT60) KELLY, b. December 23, 1972, Oshawa, Ontario; (MRS ROBERT SCOTT KELLY). 13. BARRY LESLIE (CWL AT16)8 KINGSTON (WILLIAM JOSEPH (CWL AA54)7, SAMUEL A6, PAUL5, SAMUEL4, PAUL F3, SAMUEL2, PAUL1) was born February 15, 1948 in Hotel Dieu Hospital, Chatham, NB. He married CHARLOTTE JOSEPH November 06, 1971 in Seaford, Delaware. i. MARY LOREEN (CWL AT18)9 KINGSTON, b. December 29, 1974, Ohio, U.S.A..
ii. WILLIAM FRANK (CWL AT19) KINGSTON, b. April 17, 1978, Mount Forest, ON. 14. BRENDA LILLIAN (CWL AT17)8 KINGSTON (WILLIAM JOSEPH (CWL AA54)7, SAMUEL A6, PAUL5, SAMUEL4, PAUL F3, SAMUEL2, PAUL1) was born September 27, 1950 in Miramichi Hospital, Newcastle, NB. 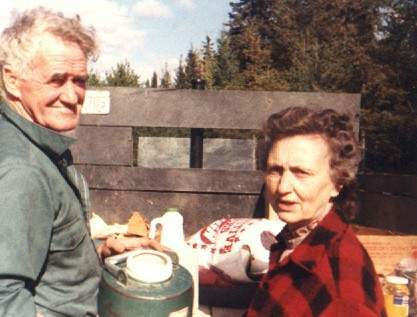 She married LEO FNANCIS MACKINNON August 10, 1979 in St James Sevogle. i. BRONWYN KINGSTON (CWL AT61)9 MACKINNON, b. October 08, 1980, (Oct 8 1981 is not correct). 15. CHRISTOPHER LEE (CWL AT71)8 KINGSTON (WILLIAM JOSEPH (CWL AA54)7, SAMUEL A6, PAUL5, SAMUEL4, PAUL F3, SAMUEL2, PAUL1) was born February 27, 1953 in Miramichi Hospital, Newcastle, NB. He married GWEN KLUKUS. i. ZACHARY (STEPSON ) (CWL AT76)9 KINGSTON, b. Abt. 1970; Stepchild. 16. CAROL ANNE (CWL AT72)8 KINGSTON (WILLIAM JOSEPH (CWL AA54)7, SAMUEL A6, PAUL5, SAMUEL4, PAUL F3, SAMUEL2, PAUL1) was born June 02, 1954 in Miramichi Hospital, Newcastle, NB. She married DARYL WESLEY MILLER September 09, 1980 in Edmonton AB. i. MEGHAN KINGSTON (CWL AT77)9 MILLER, b. November 17, 1985, Saskatoon Sask. ii. ANNIE KINGSTON (CWL AT78) MILLER, b. June 20, 1991, Almont, ON. 17. SHARON PATRICIA (CWL AT74)8 KINGSTON (WILLIAM JOSEPH (CWL AA54)7, SAMUEL A6, PAUL5, SAMUEL4, PAUL F3, SAMUEL2, PAUL1) was born July 02, 1960 in Hotel Dieu, Chatham, NB. She married JOHN DUNCAN BURN. i. ERYN HALEY (CWL AX61)9 BURN, b. September 21, 1995, Saskatoon, Sask. ii. AUSTIN BURN, b. Abt. 1997. 18. DAVID SAMUEL (CWL AT75)8 KINGSTON (WILLIAM JOSEPH (CWL AA54)7, SAMUEL A6, PAUL5, SAMUEL4, PAUL F3, SAMUEL2, PAUL1) was born October 06, 1961 in Hotel Dieu Hospital, Chatham, NB. He married GISELLE MALLEY 1996. Addresses: Chaplin Island Road, N.B. i. CARTER (CWL AX62)9 KINGSTON, b. 1996.
ii. MAGGY KINGSTON, b. June 05, 1998, Twin with Lewis. iii. LEWIS KINGSTON, b. June 05, 1998, Twin with Maggy. 19. STEPHEN CRAIG (CWL AT79)8 KINGSTON (WILLIAM JOSEPH (CWL AA54)7, SAMUEL A6, PAUL5, SAMUEL4, PAUL F3, SAMUEL2, PAUL1) was born January 04, 1964 in Hotel Dieu Hospital, Chatham, NB. He married GUILIA GIUSSEPPINA ONGARO August 30, 1991 in Sudbury, ON, daughter of MARCELLO ONGARO and GIANNINA FREGONESE. i. SPENCER DAMIANO9 KINGSTON, b. February 19, 1994.
ii. MIA GIANNINA LOREEN KINGSTON, b. October 09, 1996.
iii. RENATA MADELINE KINGSTON, b. July 08, 1998. 20. MARK CHRISTIAN (CWL AT62)8 WEISSLER, MD (ANN MARIE (CWL AA55)7 KINGSTON, BSC NURSING, SAMUEL A6, PAUL5, SAMUEL4, PAUL F3, SAMUEL2, PAUL1) was born April 27, 1957 in Sheboygan, Wis., USA. He married ANNE MARIE SAEWERT November 10, 1984 in In the living room of parents Joe and Ann Weissler. i. KATHERINE ANNE (CWL AU15)9 WEISSLER, b. December 02, 1986.
ii. SAMUEL ALOYSIUS (CWL AX63) WEISSLER, b. January 12, 1993. 21. STEPHANIE ANNE MARIE (CWL AT23)8 KINGSTON (GEORGE LEO (CWL AT11)7, SAMUEL A6, PAUL5, SAMUEL4, PAUL F3, SAMUEL2, PAUL1) was born September 18, 1954 in St Mary's Hospital, Montreal, PQ. She married ANDREW BESSERER October 1975 in Nelson, BC, son of COLIN BESSERER and (MRS.
i. GEORGE SAMUEL ANDREW (CWL AT24)9 BESSERER, b. February 05, 1973, (Birth year of 1872 is incorrect) St. Catherines, ON. ii. JAYSON ANDRE (CWL AT25) BESSERER, b. August 25, 1978, (birth year of 1878 is incorrect) Calgary, AB. 22. JOHN FRANCIS (CWL AT64)8 KINGSTON, MENG SC (GEORGE LEO (CWL AT11)7, SAMUEL A6, PAUL5, SAMUEL4, PAUL F3, SAMUEL2, PAUL1) was born June 19, 1957 in Espanola General Hospital Espanola, ON.. He married HEATHER HENDERSON December 20, 1987 in Vancouver, BC. i. STEPHANIE ONA (CWL AT65)9 KINGSTON, b. August 14, 1989, Fort McMurray, AB. ii. LESLIE FRANCES (CWL AT66) KINGSTON, b. April 07, 1991, Edmunton, AB. 23. ELIZABETH MARGARET (CWL AT67)8 KINGSTON, BA (GEORGE LEO (CWL AT11)7, SAMUEL A6, PAUL5, SAMUEL4, PAUL F3, SAMUEL2, PAUL1) was born November 04, 1958 in Espanola General Hospital, Espanola, ON. She married TERRANCE MICHAEL COX September 24, 1983 in Vancouver, BC, son of ERNEST COX and BEVERLEE FOWLER. i. CAROLYN MARIE (CWL AT68)9 COX, b. April 24, 1989, Seattle, Wash., USA, University Hospital. ii. EMILY CHRISTINE (CWL AT69) COX, b. February 22, 1992. 24. PATRICIA KATHLEEN (CWL AT70)8 KINGSTON, B NURSNG (GEORGE LEO (CWL AT11)7, SAMUEL A6, PAUL5, SAMUEL4, PAUL F3, SAMUEL2, PAUL1) was born February 28, 1960 in Espanola General Hospital, Espanola, ON. She married DENNIS GERARD BOYLE, LLB August 03, 1990 in St Mary's Newcastle, NB, son of FRANCIS BOYLE and ANNA GRAHAM. i. PATRICK DENNIS (CWL AT80)9 BOYLE, b. July 18, 1991, Saint John Regional Hospital, Saint John, NB. ii. SEAMUS FRANCIS XAVIER (CWL AT81) BOYLE, b. December 08, 1992, Saint John Regional Hospital, Saint John, NB. iii. MARY CHRISTINE ELIZABETH (CWL AV69) BOYLE, b. November 27, 1994, Saint John Regional Hospital, Saint John, NB. iv. BRENDAN LEO DOMINICK (CWL AV70) BOYLE, b. November 05, 1996, Saint John Regional Hospital, Saint John, NB. 25. MARTHA ANN (CWL AU87)8 KINGSTON, BA BED (GEORGE LEO (CWL AT11)7, SAMUEL A6, PAUL5, SAMUEL4, PAUL F3, SAMUEL2, PAUL1) was born July 30, 1963 in Trois Rivers, PQ. She married MARK BROWN October 09, 1992 in Our Lady Of Perpetual Help, Toronto, Ontario, son of GEORGE BROWN and EILEEN BROCK. i. LAURA EILEEN (CWL AV71)9 BROWN, b. May 09, 1996.
ii. LOGAN "LOGIE" GEORGE (CWL AV72) BROWN, b. December 29, 1997. 26. MARY MONICA (CWL AT27)8 VICKERS (MONICA MARGARET (CWL AT12)7 KINGSTON, SAMUEL A6, PAUL5, SAMUEL4, PAUL F3, SAMUEL2, PAUL1) was born June 02, 1955 in Miramichi Hospital, Newcastle, NB. She married EDWARD JOHN RAWLINSON September 01, 1979, son of JOHN RAWLNSON and OLIVE RACICOT. i. ERIN ELIZABETH (CWL AT29)9 RAWLNSON, b. June 09, 1985.
ii. AMY KATHLEEN (CWL AT30) RAWLNSON, b. September 10, 1987. 27. KEVIN MICHAEL (CWL AT28)8 VICKERS (MONICA MARGARET (CWL AT12)7 KINGSTON, SAMUEL A6, PAUL5, SAMUEL4, PAUL F3, SAMUEL2, PAUL1) was born September 29, 1956 in Hotel Dieu, Chatham, NB. He married ANNE SHIRLEY HUBBARD May 19, 1979 in Newcastle, NB, daughter of GEORGE HUBBARD and MARIE HARPER. Baptism: St. Mary's Newcastle, N.B. i. ANDREW MARK (CWL AT82)9 VICKERS, b. August 05, 1983, Yellowknife, NWT. ii. LAURA MEAGHEN (CWL AT83) VICKERS, b. July 08, 1985, Yellowknife, NWT. 28. CATHERINE ALICE (CWL AT31)8 BYBERG (RITA CATHERINE (CWL AT13)7 KINGSTON, SAMUEL A6, PAUL5, SAMUEL4, PAUL F3, SAMUEL2, PAUL1) was born December 18, 1957. She married (1) JOHN BRYANT Abt. 1985. She met (2) DAVID CHARLES GROWDEN Abt. 1987.
i. AMANDA ELIZABETH RITA (CWL AT32)9 GROWDEN, b. November 13, 1988. 29. PETER KINGSTON (GUY) (CWL AT87)8 BYBERG (RITA CATHERINE (CWL AT13)7 KINGSTON, SAMUEL A6, PAUL5, SAMUEL4, PAUL F3, SAMUEL2, PAUL1) was born January 13, 1958 in Toronto, Ontario. He married MARIA NILSSON. i. EISA NILSSON (CWL AT88)9 BYBERG, b. August 29, 1992.
ii. CHILD (ABT 1996) (CWL AX64) BYBERG, b. Abt. 1996. 30. SCOTT EDWARD (CWL AT90)8 BYBERG (RITA CATHERINE (CWL AT13)7 KINGSTON, SAMUEL A6, PAUL5, SAMUEL4, PAUL F3, SAMUEL2, PAUL1) was born March 29, 1961 in Toronto, Ontario. He married HOLLY JANE CARDON November 18, 1989.
i. SAMANTHA ROBIN CARDON (CWL AT91)9 BYBERG, b. December 05, 1990.
ii. JACQUELINE CARDON (CWL AT92) BYBERG, b. October 20, 1992. 31. JOHN CHRISTOPHER DAY (CWL AT93)8 BYBERG (RITA CATHERINE (CWL AT13)7 KINGSTON, SAMUEL A6, PAUL5, SAMUEL4, PAUL F3, SAMUEL2, PAUL1) was born June 04, 1965 in Toronto, ON. He married DEIDRE LOBB. i. CHILD 1 (ABT 1994) (CWL AX65)9 BYBERG, b. Abt. 1994.
ii. CHILD 2 (ABT 1995) (CWL AX66) BYBERG, b. Abt. 1995. 32. LILLIAN ANNE (CWL AT36)8 LESLIE (CARMEL THERESA (CWL AT35)7 KINGSTON, BSC DIET, SAMUEL A6, PAUL5, SAMUEL4, PAUL F3, SAMUEL2, PAUL1) was born September 12, 1960. She married NICHOLAS THOMAS NAPKE September 19, 1987.
i. NICOLA LESLIE ANNE (CWL AT38)9 NAPKE, b. November 10, 1989.
ii. ANDREA MICHAEL PAULINE (CWL AT39) NAPKE, b. January 21, 1991.
iii. ALANA MARY THERESA (CWL AX67) NAPKE, b. September 12, 1992.
iv. JANNA (CWL AX68) NAPKE, b. September 25, 1995. 33. ROBERT SAMUEL (CWL AT95)8 LESLIE (CARMEL THERESA (CWL AT35)7 KINGSTON, BSC DIET, SAMUEL A6, PAUL5, SAMUEL4, PAUL F3, SAMUEL2, PAUL1) was born November 04, 1963. He married ELAINE STURGEON. i. KELSEY ELIZABETH (CWL AX69)9 LESLIE, b. January 11, 1996.
ii. BRIAN ROBERT LESLIE, b. March 25, 1998. 34. BARBARA PATRICIA (CWL AT97)8 LESLIE (CARMEL THERESA (CWL AT35)7 KINGSTON, BSC DIET, SAMUEL A6, PAUL5, SAMUEL4, PAUL F3, SAMUEL2, PAUL1) was born January 07, 1970. She married MARK DUNNETT. i. MEGAN RILEY (CWL AX70)9 DUNNETT, b. February 21, 1995.
ii. MICHAEL ROBERT DUNNETT, b. July 04, 1996. 35. MICHAEL EDWARD (CWL AT40)8 SULLIVAN, MD (MARY BERNADETTE (CWL AT14)7 KINGSTON, SAMUEL A6, PAUL5, SAMUEL4, PAUL F3, SAMUEL2, PAUL1) was born July 09, 1959 in St Josephs Hospital, Toronto, ON.. He married MARY PATRICIA (CWL AT40-1) BARNES September 04, 1981 in St Louis Church, Mount St Louis, Hillsdale ON. i. KELLY JULIA (CWL AT42)9 SULLIVAN, b. December 18, 1988.
ii. MATHEW PATRICK (CWL AT43) SULLIVAN, b. October 09, 1991. 36. THERESA MARIE (CWL AT41)8 SULLIVAN (MARY BERNADETTE (CWL AT14)7 KINGSTON, SAMUEL A6, PAUL5, SAMUEL4, PAUL F3, SAMUEL2, PAUL1) was born November 09, 1960 in St Josephs Hospital, Toronto, ON. She married HUGO THEODORE BERGEN July 22, 1989 in St Louis Church, Hillsdale, Ont. i. REBECCA KATHERINE (CWL AX71)9 BERGEN, b. July 21, 1993.
ii. RYAN PETER (CWL AX72) BERGEN, b. July 10, 1997. 37. MARY CARMEL (CWL AT98)8 SULLIVAN (MARY BERNADETTE (CWL AT14)7 KINGSTON, SAMUEL A6, PAUL5, SAMUEL4, PAUL F3, SAMUEL2, PAUL1) was born September 03, 1963 in St Josephs Hospital Toronto, Ontario. She married PETER MCALPINE September 28, 1996 in St Alphonses Toronto. i. SAMUEL EDWARD (CWL AX73)9 MCALPINE, b. July 06, 1997. 38. MARY ELLEN ELIZABETH (CWL AT44)8 KINGSTON (ALOYSIUS SAMUEL (CWL AT15)7, SAMUEL A6, PAUL5, SAMUEL4, PAUL F3, SAMUEL2, PAUL1) was born September 28, 1961 in Hotel Dieu Hospital, Chatham, NB. She married RAYMOND C RITCHIE, BMECH ENG June 28, 1986 in Newcastle, NB. i. REBECCA JUDITH LILLIAN (CWL AX74)9 RITCHIE, b. December 26, 1994. 39. PAULA-MARIE CARMEL (CWL AT45)8 KINGSTON (ALOYSIUS SAMUEL (CWL AT15)7, SAMUEL A6, PAUL5, SAMUEL4, PAUL F3, SAMUEL2, PAUL1) was born October 11, 1962 in Hotel Dieu Hospital, Chatham, NB. She married SCOTT A MATHER August 16, 1986 in St Patrick's, Nelson-Miramichi, NB. i. ANNE MARIE (CWL AU01)9 MATHER, b. May 29, 1989, Chatham, NB. ii. SHAWN JOSEPH (CWL AU02) MATHER, b. January 23, 1991, Chatham, NB. 40. JO-ANN RUBY (CWL AU00)8 KINGSTON (ALOYSIUS SAMUEL (CWL AT15)7, SAMUEL A6, PAUL5, SAMUEL4, PAUL F3, SAMUEL2, PAUL1) was born November 08, 1963 in Hotel Dieu Hospital, Chatham, NB. She married PATRICK REICHER, MENG August 08, 1992.
i. MONIKA ANNE MARIE9 REICHER, b. June 12, 1998, Twin with Karl. ii. BENJAMIN KARL SAMUEL REICHER, b. June 12, 1998, Twin with Monika Anne Marie. 41. MARK ALLEN (CWL AU05)8 KINGSTON (ALOYSIUS SAMUEL (CWL AT15)7, SAMUEL A6, PAUL5, SAMUEL4, PAUL F3, SAMUEL2, PAUL1) was born May 31, 1970 in Hotel Dieu Hospital, Chatham, NB. He married JENNIFER MCCARTHY. i. TYLER JAMES ALOYSIUS(CWL AX75)9 KINGSTON, b. June 04, 1996. 42. PAUL JOSEPH (CWL AT53)8 KINGSTON (JOSEPH JAMES (CWL AT52)7, SAMUEL A6, PAUL5, SAMUEL4, PAUL F3, SAMUEL2, PAUL1) was born April 26, 1966 in Oshawa, Ontario. He married SHARON LOUISE RHUD October 11, 1986 in City Hall. i. JEFFREY PAUL (CWL AT55)9 KINGSTON, b. September 12, 1986, Port Perry, Ontario. ii. JOSHUA MICHAEL (CWL AT56) KINGSTON, b. January 17, 1990, Port Perry, Ontario. iii. JADE LOUISE (CWL AT57) KINGSTON, b. August 22, 1991, Port Perry, ON. 43. VERONICA JANE (CWL AT54)8 KINGSTON (JOSEPH JAMES (CWL AT52)7, SAMUEL A6, PAUL5, SAMUEL4, PAUL F3, SAMUEL2, PAUL1) was born June 23, 1968 in Oshawa Gen Hospital Oshawa, ON. She married MARK CAMERON (JOHNSON) JOHNSTON June 28, 1991.
i. PAUL JOSEPH JOHN (CWL AU06)9 KINGSTON, b. December 13, 1985, Port Perry, Ontario. ii. SEAN ALLAN (CWL AU07) (JOHNSON) JOHNSTON, b. February 28, 1988, Port Perry, Ontario. iii. CHRISTINE ELIZABTH (CWL AU08) (JOHNSON) JOHNSTON, b. February 26, 1989, Port Perry, Ontario. 44. LISA MARIE (CWL AU09)8 KINGSTON (JOSEPH JAMES (CWL AT52)7, SAMUEL A6, PAUL5, SAMUEL4, PAUL F3, SAMUEL2, PAUL1) was born June 03, 1969 in Oshawa, Ontario. She married JOSEPH OMAR PETRIE August 06, 1988 in St Marys Church, Newcastle, NB. i. MATTHEW JOSEPH OMAR (CWL AU10)9 PETRIE, b. February 10, 1988, Newcastle, NB. ii. ANDREW JOSEPH (CWL AU11) PETRIE, b. April 26, 1991, Port Perry, Ontario. iii. AMANDA PRECILLA MARY (CWL AX76) PETRIE, b. July 02, 1994.